Hawaii Academy welcomes students of all ages and skill levels. We have three facilities: in Honolulu, Pearl Harbor, and Waipahu. We offer a variety of classes to fit most preferences and lifestyles. HA started in 1999. 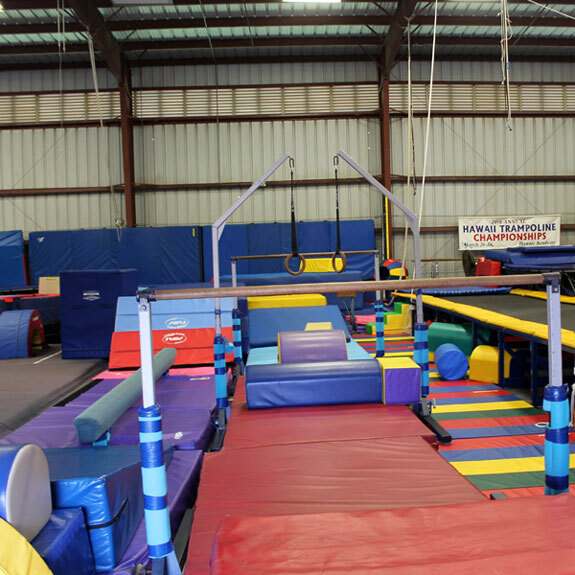 Our Kalihi location in Honolulu has operated since 2002 with 15 trampolines, rod and spring floors, special rebounding surfaces, overhead rigging for spotting systems, and one of the most advanced bungee systems anywhere! Our Kalihi facility has 15 trampolines, rod and spring floors, an overhead rigging for spotting systems, and one of the most advanced bungee systems anywhere! 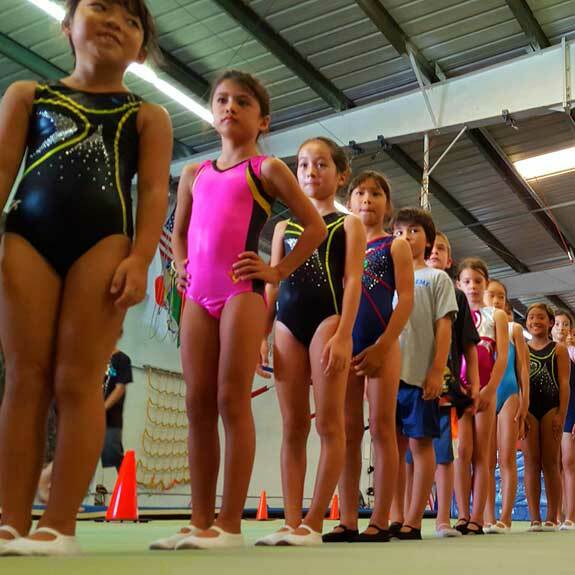 Since 2012, Hawaii Academy has been providing gymnastics and fitness classes to military families on Oahu at Pearl Harbor in a large gymnasium near Bloch Arena, named the Youth Fitness Gym. The entire family is encouraged to participate! We are now open on Tuesdays, Wednesdays, and Saturdays. Sign up for a trial lesson today! We are located in the Lighthouse Outreach Center. Drive through gate into the large building that looks like an aircraft hangar. 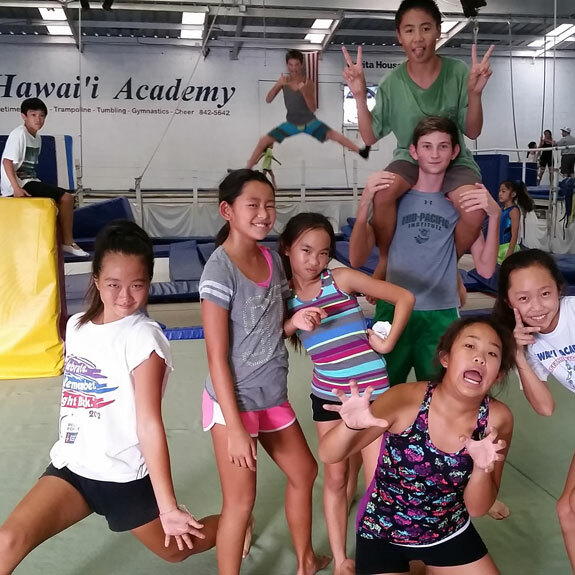 Hawai’i Academy is a private school for the advancement of lifetime fitness, gymnastics, and human sciences for students of ALL ages and abilities. The most visible service products are the development and management of educational and entertainment experiences — edutainment. Unlike most other fitness schools (anywhere), we emphasize multi-generational participation. The Academy serves as a second home for the family … as a place that promotes exercise throughout life, for each generation, in a safe environment that facilitates cooperation, group and individual motivation, determination, respect, and well-being. The Academy is unique in showcasing gymnastics across the lifespan with many multi-generational families participating together in one activity/sport. With 40+ students over 60 years of age, six in their 90s (our oldest in 102), and many of them competing in trampoline meets, HA has very inspiring senior/elder students. With 2-3 seniors dying per year there are many family stories of doing gymnastics right to the end of their life (or becoming a competitive athlete in the last ten years of their life). There are many three and four generation families exercising together, even an occasional five generation family. In addition to having students of all ages, HA has students of nearly all abilities: from remedial requiring special assistance to function, to world class gymnasts… even world champions. By promoting adult and senior/elder participation, children today see themselves as future active adults (like their parents, grand parents, and great grand parents). We have a broad range of adult programs (fitness, trampoline, tumbling, dance, martial arts, & circus skills) and Kupuna (50+ yrs) fitness classes and even teams that compete in trampoline gymnastics (19-101 yrs). We have had two year old to 98 year old state champions on the trampoline and several four-generation families competing in our meets. We have remedial classes for special needs populations and training programs for world class athletes. We provide educationally challenging and fun activities for ALL ages and abilities with gender equality. We aspire to achieve excellence in our programs (e.g., our Research Department is 20 years into running the Hawaii Longitudinal Study of Fitness, the only one of its kind for ages 1 to 100+, and the Sports Department has three gymnasts on US national teams, two of which are making a run for the 2020 Olympics). But more important than rapid skill achievement is breadth of application and development of personal values and training attitudes that transfer across endeavors throughout one’s life. Gymnastics training is fundamental and transfers to all physical activities and sports (video).